I am looking forward to mentioning this fundraiser for your kid's school. I am not too far from you, in Southampton (Bucks County), PA. I used to work in Bristol. PA.
We go to Peddler's Village all the time. Very nice area. I hope i win at least one, specially the startwars sets. I love them!! Feel like my 75$ contribution wont be enough haha. I reeeaally want those. Have just purchased 3 tickets. Best of luck to all and of course to the fundraiser. Thanks. I appreciate the bump. I won't let people forget. This is awesome! My children are students at St. Paul School and we are humbled by the support seen here from far and wide! Ed Mack has said it in previous messages but this is a school worth fighting for! Our graduates are excelling at both the high school and college level and are confident, moral young adults who give back to their community. My daughter is PROUD to be smart, and its a school that is cool to have good grades - National Junior Honor Society was first introduced to us last year when she was too young to be eligible and she knew from that moment that she wanted to be a part of that "elite" group of students! My son reads above his grade level and wants to excel because that's what he sees around him. KEEP ST. PAUL STRONG for many generations - its worth it - and Ed thanks again for organizing this - it's a great approach for our fundraising efforts! Thanks everyone for supporting - I'll be buying tickets for my 8 y.o. or he'll never speak to me again (lol). Thanks for sharing Lucy. Lucy is St. Paul School's PTA President and does a great job. Ed and I have created a special group called "Giving Back" for members that have donated to Brickpicker Fundraiser. We truly appreciate those that are giving back to Brickpicker and helping with a very worthwhile cause. You will see certain members have a new little badge on the profiles. If you did donate and used a different email address, please feel free to send me a PM and I can add you to the list. I will try to run an update every day or two until the fundraiser closes. It is a simple gesture to show our appreciation!!! We also added a color to the Giving Back group that you can see them in the list of logged in users. P.S. Mods will still retain their mod icons, I don't have a way to show two icons. I still don't have an upgraded awards module to add to this forum, so this is all I can do for now! Like Jeff said, if you have given to the St. Paul School raffle and want an icon, let us know. We don't have all the emails and some people were left out so we can add you. I appreciate all that has been given so far...I really do. I gave under a different email, but since the Mod icon can't be replaced I guess it doesn't really matter lol. I am not a tax expert, but this can add to write offs for 2015 and I believe today is the last day. Charity is a great thing! 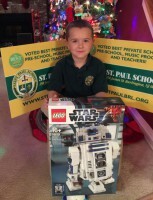 St. Paul School is a qualified 501(c)(3) entity and donations are deductible in accordance with the tax laws. All funds raised through this site will only be used only to support St. Paul School for the 2016-2017 school year. Just purchased 5 (out of the possible 6 choices) tickets in the raffle. Depending on what will be added for the 7th option I might purchase another ticket for that one too when it's revealed. the donation for this good cause will be billed by "WPY*RallyUpcom". The Second Bundle will be better than all the others. I'm just waiting to see how this all plays out to see how I want to promote it. Generosity makes you healthier...so buy some charity St. Paul School raffle tickets and live longer at the same. Be sure to tell her that I, Kevin Puls, sent you. Kind of disappointing to see that less than 1% of the community has participated in the raffle for a good cause. They are excellent prizes after all. I bought a few tickets today, new to the brickpicker community. Getting 2016 of to a good start, be positive and support this good cause. There is still almost a month left yet and the holidays are finishing up, so I am I hoping that more people will find it in their hearts to buy a few tickets for a chance to win some top notch sets and to help some kids and teachers stay in a great school. In a way, the response to this raffle will tell Jeff and I (...and the other LEGO fan sites) what BrickPickers are made of. Are we givers or takers? My glass is half full, so I am counting on this community to come through for people in need. Just bought 7 tickets. Happy to help!